A number of inspiring quartets have stopped off in the Bay Area this season. The latest of these, the Miró Quartet, has crisscrossed the world for the past fifteen years from their home base in Austin, Texas to perform in prominent concert halls and festivals. These musicians also appreciate the lustrous sound of intimate halls and came to Burlingame’s Kohl Mansion on Sunday, March 9, for an absorbing evening of Haydn, Dutilleux and Beethoven. The fine-grained ease of their sound was evidence of their intelligence and hard work, as they balanced exactitude with feeling. This was apparent as soon as they opened with Joseph Haydn’s String Quartet in D Major, Op. 64 No. 5, aka “The Lark.” One of Haydn’s own favorites, it is an example of the even-tempered empathy that he strove to create. It is thought that the “Lark” nickname referred to the soaring yet delicate song quality of the first violin part, and violinist Daniel Ching rose to those demands nicely. Over congenial chords from the other strings, he delivered high notes that were fat with feeling and filigreed with elegant trills, evoking a typically classical satisfaction and bonhomie. In the following Adagio movement they leaned into an understated sorrow. They were more smooth than sweet in the top layers, and more stern than growly at the bottom. They had, in other words, a lovely facility of sound and emotion. Ching often leaned towards cellist Joshua Gindele, while William Fedkenheuer, playing second violin, maintained a closer association with violist John Largess, cross-accenting the natural roles of paired violins and paired lower strings. Henri Dutilleux’ Ainsi la nuit (Thus the night) had an uncertain sort of beauty, treacle-y and full of harmonic fogs and treacherous steps, interrupted by sudden stridencies. Written in seven continuous movements, the four attacked with conviction. It was a difficult work with extremes of texture from Spectralist decays to insectile chattering. There were thin high passages and fever-bright chords, countered by obsessive viola and brooding cello. While this was expressive and technically eye-popping, it was not quite as convincing as the final work on the program. Two huge chords drew us firmly into the work. It was impatient, powerful, subtle, intensely personal and sweeping. In other words, it could only be Beethoven. And in this, Beethoven’s String Quartet in E minor, Op. 59 No. 2, the four showed their truly impressive accord. The Adagio was simply gorgeous, with each instrument favoring part of some grand design: Ching expressed passion while Fedkenheuer, the second violin, embodied brotherhood. Gindele somehow extended the parameters, defining the heavens and the richly loamed earth on his cello’s long neck, while a viola’s chesty yearning peopled it with humanity. The Miró Quartet was recently acclaimed for their performance of the complete Beethoven Opus 59 string quartets at Lincoln Center, and so it was no surprise that they followed their program with an encore of more Beethoven, the last movement of Opus 59 No. 3. Structured as a fugue, it was his homage to Bach. Like all concerts at Kohl Mansion, the immediacy of the sound was a treat. Next in their music series, they will host the young and spirited Ariel Quartet on Sunday, April 13 at 7:00 p.m. Information is available on their website, at musicatkohl.org. 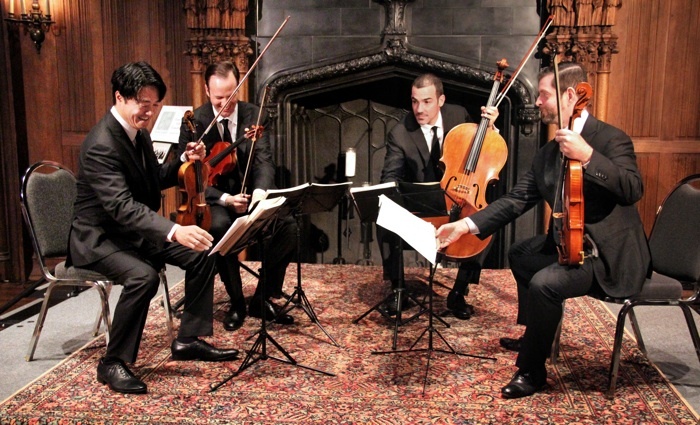 Photo below taken of Miró Quartet at Kohl Mansion on March 9, from left: Daniel Ching, William Fedkenheuer, Joshua Gindele and John Largess; photo by Rick Gydesen.